K-6 gunboats was once found in all areas of Klingon space, especially those occupied by servitor races, where it patrolled star systems in groups of five looking for black-marketeers and others involved in illegal acts. It was originally never intended to deal with capital ships, although later models would find them selves tasked with this duty. Early models of the K-6 were particularly well known in the Triangle, where many operated, either under the Klingon banner or some other; By the mid 2280, information indicated that six of the Romulan version, the P-12, operate almost exclusively there. The K-6A, introduced in 2266 at both Fonawl and Taamar, mounted the KWA-2 warp drive system. This was found to be inadequate for maneuvering the vessel, and the K-6B was designed with improved engines. Before this model was put into production, however, it was replaced with the K-6C, which had improved weapons and shield generators. The K-6C was more maneuverable, has better than double the firepower, has shields that are 50% more efficient, and has a superstructure capable of taking twice as much damage. Refitting all existing vessels to this configuration was begun immediately, and was completed by 2278. The K-6D was built to improve the overall firepower and create a more effective design against medium capital ships. The addition of a third KD-7 was overshadowed by the inclusion of two KP-2 torpedoes. Although light, the firing mechanism and torpedo storage made the K-6D extremely cramped, even by Klingon standards. The variable firepower and weapon choice available to ship commanders made the K-6D popular none the less. The K-6E again attempted to streamline the combat capability. Reverting to the twin forward heavier distruptors and enlarging the torpedo bay to a single system, the K-6E was more combat capable. Both the K-6D and K-6E served well into the 2330s. While production had long since been halted, and most K-6s had been relegated to secondary duty well within Klingon territory, the K-6G would reverse all that. While the K-6 was no longer the most numerous gunboat in the empire’s service, it was still effective. A new computer system, longer ranged weapon and significantly improved shielding system allowed the K-6 to serve well past it’s initial retirement date. 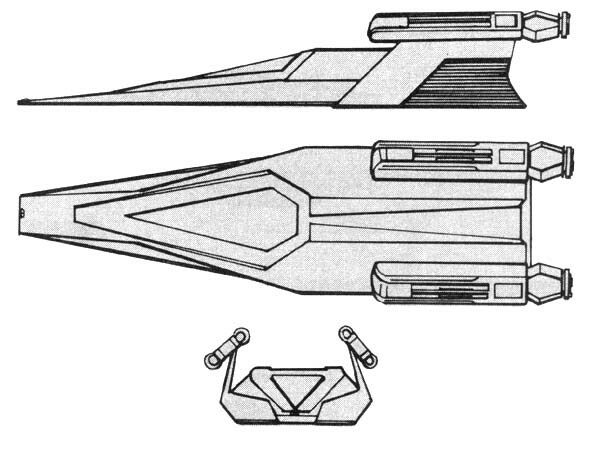 The K-6G would see extensive service against the Cardassians and Dominion during the war. 26 K-6s are listed as missing, including 9 As, 2 Cs, 4 Ds and 11 Gs. 64 As, 28 Cs, 34 Ds, 12 Es and 329 Gs have been destroyed. 3 As, 3 Ds 1 E and 182 Gs have been scrapped. 8 As are used as classic training vessels. 15 As, 1 C, 2 Ds and 7 Gs have been captured. 25 Es were sold to the Naussicans and 25 more were sold to private interests in the Triangle. 220 As were traded to the Romulans. 256 Gs are in reserve fleets. 5 A and 50 Gs are in service to Ranking Families in the Empire. The class name is translated from the Klingon lar’hal. Power Units Available – 10 ea. 9 ea. 9 ea. 9 ea. 9 ea.